In the end we liked Croatia and would probably return; however, we expected to like Croatia more than we did in actuality. Is it heresy to NOT rave about a place that everyone raves about? Don’t get me wrong: we are glad that we made the trip and we really enjoyed our extended time with Rick and Jane, but the country did not enchant me as I had thought it might. That’s the problem with expectations: sometimes things do not live up to them. Along the Korčula waterfront in the morning, soft light, pastel colors. Everyone said we would love it, and we did like many things; the sailors in the group would perhaps like to take a coastal sailing trip and pull in to dine each night since the food and wine are so darn good. It is beautiful. The waters are clear and the coastline is pristine. The cities are clean and there is no litter. The food is great. Heavily influenced by Italian and other Mediterranean cuisines, it features lots of fresh seafood and is well-prepared and healthy. There was some creativity in the cuisine we enjoyed in Dubrovnik. I expected more of a Balkan meat-and-potatoes diet but was pleasantly surprised. Dining is not expensive. One night in Dubrovnik (the new port area) we had an excellent two course meal including antipasto, main and contorni (usually sold separately in Italy) plus 2 glasses of wine each for about $68.00 for two. We’ve paid more than that for pizza, wine and fritti in Roma when the exchange rate was poor. The people are very nice and speak English fluently. While I cannot read much that is written on signs, the spoken English is clear and correct grammatically. They learn it from TV as the dubbing so prevalent in Italy and France does not exist there. Croatians grow up hearing English and reading the Croatian subtitles. Every single toilet we’ve been in has been, at a minimum, sparkling clean and often very nice. I know this seems odd, but when you have encountered the bathrooms on Trenitalia or in some Roman bars, finding a country full of clean restrooms is a pleasure. No one is selling Selfie-Sticks, roses, or flying light-up junk in the street. Hallelujah! Ric and I took a lot of pictures…. Click on any one of these for some highlights from our time on Korčula. Korčula has several towers. Very picturesque. During our tour of the island, we had a chance to see Korčula from on high. Yachts and sailboats are everywhere! Waters seem calm. Collection of implements from days gone by at the museum in Blato. This little guy hung around a winery on Korčula waiting for us to leave so he could get some of the leftover cheese. Ric obliged him. The garden corner at the end of our “street” in Korčula. Nice to see the greenery amidst all the stone. Rosario was our host in Korčula. A former sea captain, he has settled back in his home town. Along the seawall in Korčula one finds well-located tables morning, noon and night. Sense of humor at a Korčula restaurant. Waiting for our ferry to the Pelješac. Goodbye Korčula! There is a lack of efficient public transportation within the country so we had lots of windshield time. The train system is non-existent so most long haul travel is bus or ferry (or plane). 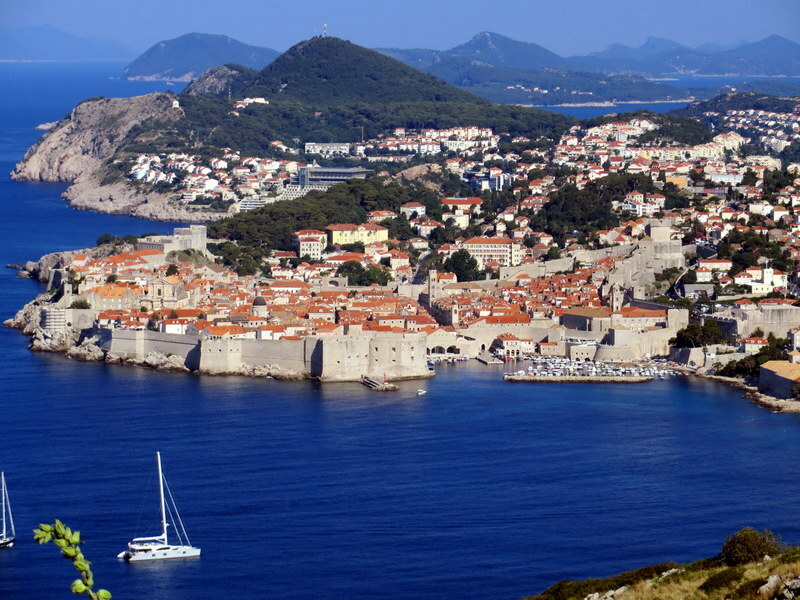 It can take 4 or 5 hours to go from Dubrovnik to Split by bus, or 4 to 11 (eleven!!!) hours by ferry. Driving is 3.5 hours so that is what we did on our return. If you like to drive, it’s great. But be prepared to spend a lot of time getting from one place to another. It is dry, at least in Dalmatia. I like a more forested place, a rainforest with big, big trees. This is dry like Hawaii at Kona or parts of California. Obviously a personal preference. Beachgoers would love this climate. On a typical day, cruise ships in port – both old and new – plus launches to carry passengers to-and-fro. …Dubrovnik Old Town a caricature of itself. “There is no there, there,” as Gertrude Stein famously said (although about Oakland, CA). Shops and restaurants overwhelm what could be a very pretty, quaint place. The hawkers in front of restaurants in Dubrovnik are indefatigable. They thrust menus in your face in an effort to attract your business. Very desperate seeming and annoying, adding to the State Fair atmosphere as one walks down a crowded street. The lack of racial diversity was odd. Racial minorities were conspicuously absent. I conjecture that because Croatia is not yet in the Schengen Zone, the immigrants arriving in Italy, Greece and Spain are not making their way here. I must give the Croatian people credit for their recovery and the building of a tourism industry that provides much-needed capital to its sagging economy. Twenty years after the war, you’d hardly know the war happened except that memories are long and when one engages a Croat in conversation one hears widely varying points of view from “It was better under Tito” to “Thank God the Communists are gone!” But it is difficult to get a feel for Croatian culture when you are so surrounded by TOURISM. Also kudos to Croatia for good roads, overall. We were impressed by the autostrada, which although of limited presence was well-engineered and the tolls were cheap. Be prepared, though, for sticker shock of a different nature: prices look high but are actually moderate. The Croatian Kuna is about $.15. Yes, fifteen cents to the kuna (hrk). When you see a price on a menu of 110.00 hrk, your mind does a flip thinking “$110.00!! !” but it turns out to be $16.47 for that marvelous grilled tuna! Our four-night apartment rent was a staggering 5416 hrk, but a reasonable enough price in Euros. One throws around 200.00 hrk notes like twenty-dollar bills in the U.S. Eating. Everything. Croatian prosciutto is delicious and different from Italian. They know what to do with mussels, risotto, and octopus. Pasta is perfection, grilled calamari sublime. Blitva may change my relationship with chard forever. Try sheep’s milk cheese from the island of Pag. It is perfect with their red wine Plavic Mali. See also my blog at Our Weekly Pizza for lovely seaside pizza dining in Korcula. Exploring the island of Lokrum, just offshore of Dubrovnik. Wooded paths, a Napoleonic-era fort, and fantastic views are coupled with an absence of crowds. As in any good Italian location, one could get a good cappuccino on the island, served in a proper cup, not the American standard, Styrofoam. Ric demonstrates how uncrowded Lokrum is compared to The Stradun. Lokrum Island peacock. They are everywhere! The path to the fort on Lokrum went up and up and up, no switchbacks, just a steady climb in the sun. From the Napoleonic-Era fort, one can see the boat activity coming, going, anchoring off Dubroivnik. View from the fort at Lokrum back to Dubrivnik. A 14-minute ferry ride but worlds apart. From the mainland, high above Dubrovnik, looking back to Lokrum. You can just see the fort. Driving into Montenegro where there are more vestiges of the Communist Era than we saw in our Croatian wanderings. The Bay of Kotor is pretty and we had a nice lunch in Kotor Town, although once again a fortified city has been made a tourist zone and feels unreal. Walking the walls in Dubrovnik, although I wish we had gone at 8:00 AM in the rainstorm when, according to friends who did so, they were the only people up there. The views are great, but it is a conga line that only moves at the speed of the slowest, most out-of-shape person. Thankfully that was not me. From below, one sees heads bobbing along as people walk the walls. The Stradun in Dubrovnik as seen from atop the wall. There are a couple of refreshment spots and cafes atop the walls. How civilized! A bit windblown, high atop the walls, with Lokrum Island in the background. One must walk the walls counterclockwise. At some points it is a conga line. This view is behind us. Kitty hiding in the plants growing in a high garden as we walk the walls. Our tour of the Pelješac Peninsula, famous for wines most North Americans have never heard of unless they’ve been in Croatia. Pošip, Dingač, Plavic Mali: all good! People are passionate about their wines and we know why after a day of tasting. Our driver and guide, Petar of Dubrovnik Riviera Tours, was excellent giving us lessons not only in the wines of the region but of the recent history and political turmoil still simmering. On the Pelješac all grapes are harvested by hand. As it is a dry climate and there is no irrigation, the vines are allowed to grow unsupported. Ric at Matuško. The barrels are larger than most we see in Italy. The Pelješac is mountainous and blessed with dramatic views. Barrels at one of the wineries we visited making the excellent red Pelješac wines. The famous wall at Ston, once known as the “European Wall of China,” is 5km long. View over vineyards on the Pelješac Peninsula. The Korčula Island Tour with a driver/guide, including the Ethnographic House in Blato where we were treated to a dose of cultural insight by a kind woman who was preserving the old ways of her family and sharing them passionately with visitors to a museum kept in the family home. It seems the Croatian emigration was akin to the one from Sicily and Calabria in the early 20th century. The War Photo Limited museum in Dubrovnik which gave us some insight into the war specifically in this pretty city we had wandered. It was sobering and moving to think of something so brutal so recently in the Western world. We like an active vacation and in summer hiking is a favorite thing to do. There is some hiking in Dalmatia, but the dry landscape and the heat limited attractive possibilities for us. We are not beachgoers so that as an activity was out. There are museums, but not the knock-your-socks-off variety so prevalent in Italy that one has to see before dying. We had a lot of transport time with two day-long professional tours in vans, one day-long self-tour in a car, and one half-day driving back to Split. That’s lot of windshield time in a week for Ric and me. Luckily my brother was driving, or we had a tour guide. Split is charming lighted at night. So we planned 4 nights/3 full days. In planning the trip with one night in Split and two on Korčula, we thought the centerpiece of our trip should be the 4-night stay in an apartment high above the Adriatic in Dubrovnik. The Stari Grad (Old Town) was so crowded, hot (breezes were rare) and annoying we could barely stand to pass through it. In our experience, restaurants outside of the Stari Grad were far superior in food and atmosphere, and where the locals go. Thank goodness we stayed outside the old center! 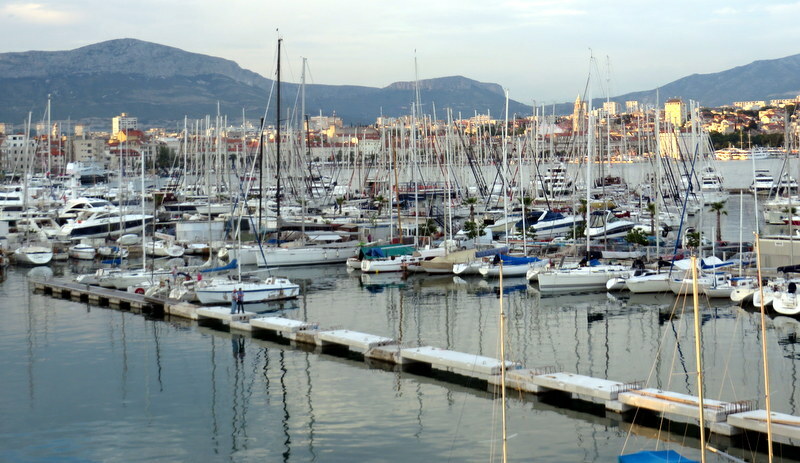 Sailboats crowd the Split marina as the sun colors the town. Split, on the other hand, had a great vibe and we could have spent more than our allotted half-day there had we known. Maybe the Dalmatian Coast of Croatia is more suited to the two-or-three night hops that Ric and I usually avoid. If you like beach time and really want to relax, or if you like sailing, the Dalmatian Coast is probably your cup of tea. We are happy to have visited and learned a bit about the history both ancient and recent. We had a great time with my brother and sister-in-law! We are happy to have dined so well, been treated so kindly, and to have been exposed to the fabulous wines available there. The Italians, the French, and other cultures that have long been overrun by touristic hoards could learn a few lessons in customer service. The Croatians, Montenegrins, and Bosnians have it down. They are very friendly and one is made to feel welcome in a most hospitable way. Our travel companions, Rick and Jane. Another Dubrovnik cat enjoys a nap despite the parade of tourists. “Buster” visited us regularly at our apartment above Dubrovnik. He liked cheese. Detail on one of the walls of Dubrovnik. ← Where few Americans venture…. 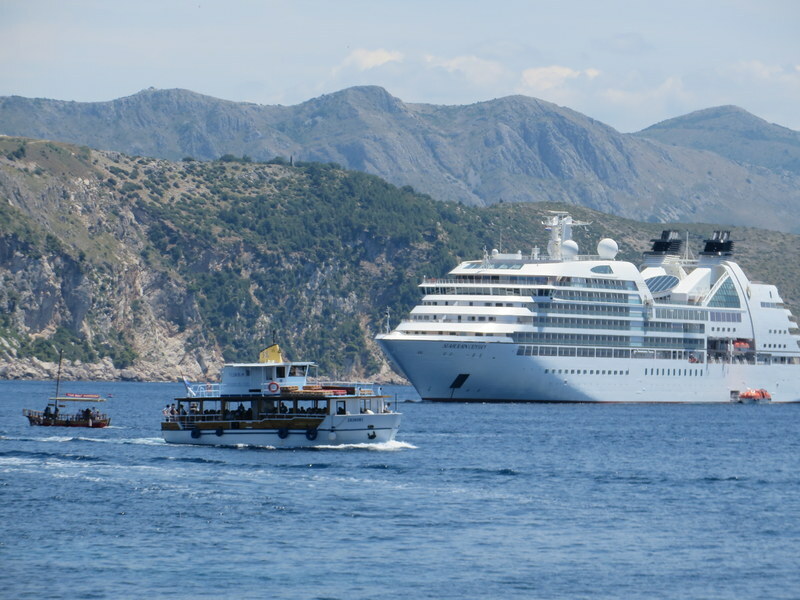 We were certainly lucky to be the only ship in Dubrovnik for our visit. Big benefit to touring in the shoulder seasons. Crowds make a huge difference. You were indeed lucky, Gracia! I think on a clear winter day it could be enchanting to walk those little streets! Lovely photos. As you may remember….I love the cats. Yes, the kitties, so special to us, too. I forgot to include the napping cats picture. On the terrace outside the Duomo there were about 5 cats sprawled on their sides, all facing east with the sun on their backs. They looked dead, frankly, but they were just enjoying a nap. We saw several feeding stations, so as in Italy, there are the “gattare” who care for them. My cat sleeps so soundly that I often watch to make sure I can see him breathing. Oh, to sleep that soundly! Good to know someone cares for the cats. I’ve visited both Torre Argentina in Rome and the Dingo sanctuary on the Lido in Venice. This was where I saw that Italian cats prefer spaghetti to kibble. What a great travel summary. A friend spent her honeymoon in Croatia in April and I thought, What a weird place for a honeymoon. But your descriptions make it an interesting place. Always enjoy reading about your travels. Croatia is so varied it seems. We did not see half of it. The north is supposed to be beautiful too. Perhaps less overrun with tourists? Thanks for such detail about this excursion. I too have heard Croatia is a MUST do so your review is invaluable and always wonderful to see how you are enjoying retirement. Ciao Barbie! I am not sure I would put it in a “must do” unless the traveler is sure about what they want to do. We like to be very active but the activities there were not our cup of tea: sailing, beach time, shopping, car tours. All that eating without hiking/walking took its toll! But it is beautiful! Your photos are fantastic. We were in Croatia just once and then only in Dubrovnik but you are so right…the water is so clear and the views gorgeous. That Dalmatia area sounded quite nice too from your description. I just love reading your food reviews! Thanks Marcia! We did love the food! How did you feel about Dubrovnik? Was it crazy with people?